The Irish language arts in West Belfast have reached dizzy new heights. 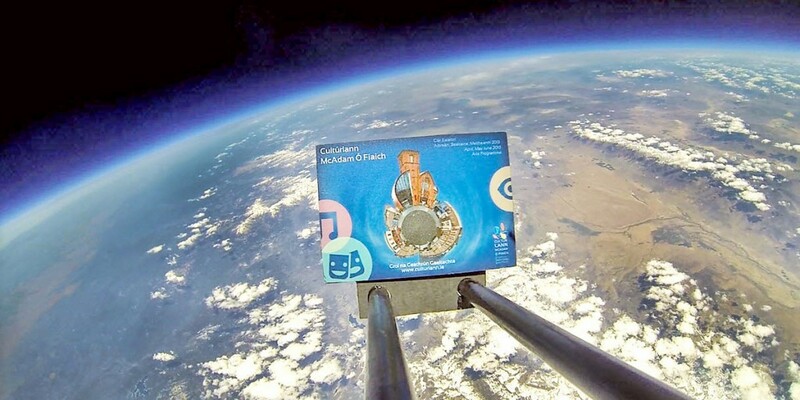 A copy of An Chultúrlann’s arts brochure travelled 40 kilometres attached to a helium balloon up through the atmosphere to the edge of space on May 11 and returned to the earth by parachute. On-board cameras recorded the journey and provided spectacular images high over the mountains and deserts of the western USA. The journey lasted around five hours, with the balloon being launched from the town of Bishop, California and landing later among the majestic giant redwood trees of the Sequoia National Forest in the same state. “People got very excited in February when the first words in Irish were tweeted from the International Space Station,” explained Frainc Mac Cionnaith, Events Manager at the Cultúrlann. “I have been following spaceweather.com for over ten years. Earlier in the year the story was posted there that Tony, the guy that runs the site, and his school students were fundraising for a big project and that they were looking for paid advertising to send up to the edge of space. It was that simple. I immediately sent a Facebook message and it went from there. We decided it was time to send up some Gaeilge, something that was representative of the whole language and associated culture, something more than just the cúpla focal. We had to consider what we should send that would represent the vibrancy of the living language and that would suitably mark this momentous occasion. We considered sending a dictionary, or a poem, or even a recording of a song or spoken word. In the end, we decided on the Cultúrlann arts programme.